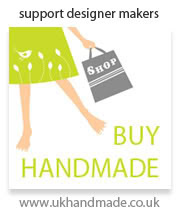 Christmas Craft market at the William Morris Gallery! It seems to be quite fitting that we are hosting our Christmas Market in the home of the father of the Arts & Crafts movement! Situated on Forest Road the gallery is home to some stunning art work and we're very happy to be able to set up our event amongst the works of this fine British artist! Come spend the day browsing through contemporary craft in these beautiful surroundings. Find extraordinary one off designer gifts, view one of the richest collections of Art & Craft in the country, try your luck at the Tombola and buy something you won't find on the High Street! It's the perfect way to dazzle your friends and family with great,high quality, original Chrimbo presents bought directly from the designer makers! I'm sure Mr. Morris would be quite proud and most likely would have his own stall presenting designer items to the masses!!! Also to be confirmed: Local Choir to perform a few seasonal tunes to get you in the festive spirit! From 11 am to 4pm. Free entry. "The William Morris Gallery is the only public Gallery devoted to William Morris - designer, craftsman, writer, socialist and conservationist - and displays an internationally important collection illustrating his life, achievements and influence. William Morris was born in Walthamstow in 1834. 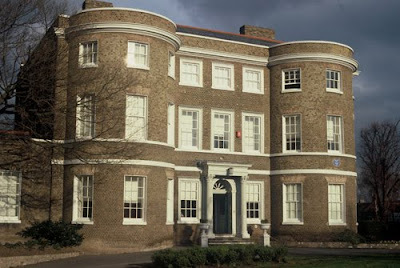 The Gallery is delightfully housed in the 18th Century Water House, Morris' family home from 1848 to 1856, and set in Lloyd Park in Walthamstow." Once again our calls for assistance for illustrators have been fruitful. I told you before...they are a very generous,kind,talented bunch of people! So after our very successful 3rd issue of the Craft Guerrilla Craft Zine we decided that we'd like to share the platform once again and help out our illustrating friends to reach another audience...also it's pretty handy for us because we get gorgeous art work for our Zine! It's a win win situation!!! POSTER- A Xmas Craft Market, on Sunday 6th of December at the William Morris Gallery, Walthamstow. It will be a Craft market with stalls, a craft corner and a Choir (though we're waiting on confirmation on this so maybe have it on a separate layer which we can alter if needed). 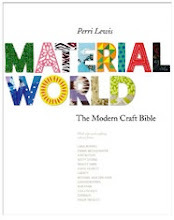 We need something which illustrates the spirit of the Arts & Crafts movement,the brotherhood, modern craft,community,the holiday season and some how incorporate William Morris work...maybe a homage to his lovely prints? Zine- it's our 4th issue! As it's tri monthly it will have to be quite varied and not just Christmasy! Also it's back to the usual low tech format of Black and White! We'd need a cover...winter scene (with the prospect of Spring would be nice), craft,homeliness,nesting,hibernation etc. 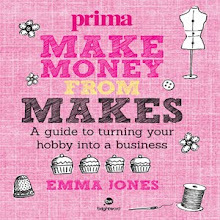 We also need images to illustrate a few articles on - Fashion,baking and craft (d.i.y. craft, making and mending ethos). 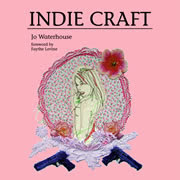 It's pretty free but I need a loose following of the brief.Remember it doesn't have to be all cute and fluffy...we like dark humour and want something pretty modern and vibrant though I am also a BIG fan of cute so don't hold back! As a thank you you will receive a link on the Zine,our web site and blog plus we'll be happy to help you any way we can. Big craft hugs to you all!!! Volunteer your sewing skills to Crisis! Crisis needs you in London from 23 to 30 December! If you can donate your time to this charity then please contact them through their web site: www.crisis.org.uk/volunteering. or call them on 020 7426 3874. The sewing and alteration service plays a vital role boosting the self-esteem of guests at Crisis Christmas by making alterations to their clothes and repairing their precious personal items in order to make them feel special and look fabulous! 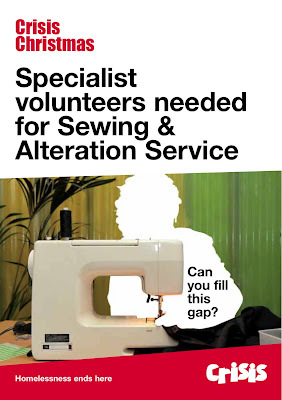 making experience through to those who just love to sew to help us run the service this year. 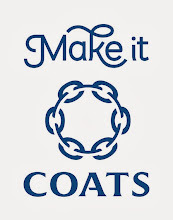 Even if you only have limited experience, you can help with the basic tasks such as sewing buttons on clothes and taking up hems – all tasks, however small, are important and really appreciated by our guests. So whatever your background in sewing, please sign up today. up for a minimum of 2 shifts. Make November a month to craft! We love autumn,not just because the leaves turn a beautiful shade of GOLD but because it gets us in the mood to knit. No more sweaty hands just lovely,lush yarn turning in to a host of usable and handy comforting items.Summer is such a put off for knitters. Wool and blazing heat do not mix! And also with the run up to Xmas we're readying ourselves to bring to the good people of London great crafting ideas for all you lovelies to make and gift to your loved ones!And for those extra lazy people...you can buy a d.i.y. craft pack and give it to a crafty friend. Hmmm lazy or just smart? Because it's even less for you to do and because the best gift you can give is creativity we think you'll be on to a winner! They'll love you forever!!! Thursday 12th November at "Ye Old Rose and Crown" pub Hoe St. Walthamstow E17 8pm - 11pm Free entry! It's official we're back in E17! 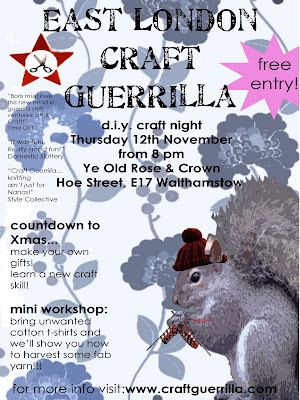 Join us a Ye Old Rose and Crown ( Hoe St.) for a night of mid week crafting. It's a short hop and a skip from the tube station. We're back with the usual crafty goodness: D.I.Y. craft packs,in house tutors and guest tutors plus a few extras like one off workshops. This month we'll be showing you how to up-cycle tee shirt yarn. It's a great way to recycle your unwanted tees and make something new...and just in time for Chrimbo too! Bring a few cotton jersey tees (fine weave works best) and we'll show you just how to harvest your very own yarn! After that you can either crochet or knit yourself a snazzy little something! Free entry!Small charge per craft pack though you are welcome to bring your own projects and sit with us in this creative get together. From 2pm to 5pm Upstairs in the Victorian Saloon. 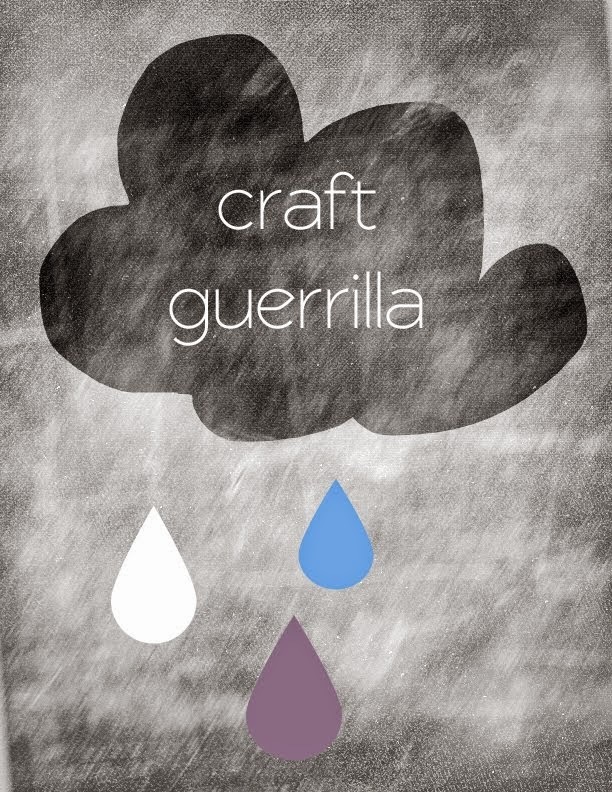 Join the Craft Guerrilla girls for a night of Christmas themed crafting. We'll have new craft kits for you to make to give as gifts -and the kits make great presents themselves for a crafty friend or relation which means less work for you! There will also be kits for things to make your home look Christmassy. Needle-felted tree ornaments and snowflake bunting can nestle cosily alongside your knitted slippers while you craft away wearing your knitted arm-warmers to stop the winter chills. Well, who says you can't make a present for yourself as well?! We love sparkly things...ooh yes we' are Magpies don't ya know...and because we've had so many requests for stalls at our markets by talented jeweller folk that we decided to host a very special event! A one stop shop where you can get all your jewels and holiday accessories event. A place where all you fellow magpies can come to and get that sparkle fill! You'll find a selection of great jewellery to suit all budgets and tastes. Great for finding a special gift for a family member,partner,friend and even for your self. They say charity does begin at home! This "Christmas Sparkle" night is a one off special shopping event at the Nags Head Pub in Walthamstow Village and will be set up by one of our core members under the East London Craft Guerrilla banner. Date is yet to be confirmed. If you are a jeweller get in touch with Ellen send a few jpegs of your work and she'll let you know. 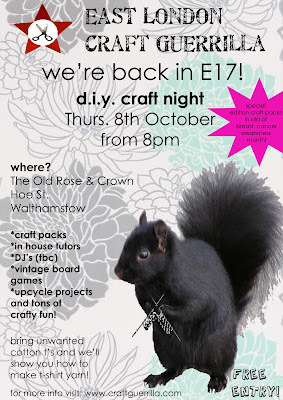 Craft is back in E17! It's official we're back in E17 with our original d.i.y. craft night! After a short absence we've found a lovely new venue. Our new home is The Old Rose and Crown. A friendly and arty pub just a hop and a skip from Walthamstow Central tube station ( Victoria Line/ Train from Liverpool Street Station)! Thursday 8th of October from 8pm. We're the original Craft Collective that brought d.i.y. craft packs to UK Craft Nights! Because we want Craft to be easy,fun and accessible we love bringing ready to make projects to the good people of London! As part of our comeback we're feeling generous and because giving is good for the soul we're donating £1 from each selected craft pack in aid of Breast Cancer Awareness Month. Lots of cute,pink,girlie d.i.y craft packs for you to make and remind yourself of your good deed! Also as part of our mini work shops and "classes for the masses" we want our friends to be self sufficient so we're showing you how to harvest T-shirt yarn so you can get busy knitting or crocheting some fab goodies. Because it's almost "THAT" time of the year again we want to help you give your loved ones lovingly made presents without breaking the bank...and we think a hand made gift is so much more fabulous! Bring a couple of unwanted cotton tees ( fine weave with a bit of lycra works best! ) and we'll show you how! From 8 pm onwards. Free entry. Small charge per craft pack. Monthly "Crafternoons"at the Old Queens Head 2pm-5pm. Every second Saturday of the month!